Print the Author Index and/or Title Index (approximately 20 pages of simple text, prints quickly) & use them as guides as you browse our site, mark off the books that interest you. Then call or email your order. A new theory of his death. The program to the Eroica Symphony, reconstructed. "Better books make better Astrologers. - Treat yourself!" You Need a nEw ePHemERis ! 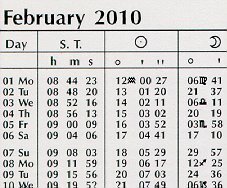 AstroAmerica's own Daily Ephemeris. Available for 2000-2010, 2010-2020, and 2000-2020. Set for Midnight, includes Sun through Pluto. Has full apectarian, daily declinations, void of course, lunar phases, eclipses at the top of the page (where you can find them! ), Julian day, SVP, etc. Includes Chiron every three days. An outstanding book in an easy to read format. Price: $19.95 for the eleven year books, $29.95 for all 21 years. Start the New Year with a New Ephemeris! Click on the cover, or the link above, for more details. Click on the page for a PDF sample. 20 miles north of Baltimore, exit 77B on I95. Come browse in person! We are one of the largest suppliers of professional astrology books & tarot cards in the world. We stock around 1000 western astrology books, over 200 Vedic astrology books (most imported from India), and some 200 tarot decks. If it's astrology & if it's in print, we probably have it. I am now doing a monthly newsletter. In each, a critical survey of books on some astrological topic, something new & notable, perhaps a bit of news from the larger AstroWorld, and an ongoing series, On The Aquarian Age. It's a one-page PDF with lots of bright colors. (I traded more pages for more frequency.) In the newsletter, both images and colored text are hyper links to more information. Sign up to be notified when it appears, a simple, short email. After you submit this form you will receive an email asking for confirmation. Once you are confirmed, you will be on the list. See archive, and the current isssue here. Scrolling through the Author index. Scrolling through the Title index. How to use: Enter a search term, hit ENTER. You will get a list of pages on this site containing the term. To refine your search, go to a page, go to EDIT on your browser (IE or Netscape), go to Find in This Page, enter your search term again, and you will arrive at the exact word(s) desired. Or, if you select Google's cached page, Google will highlight the desired words for you. Please be advised Google's cache may not be up to date. Safely & securely order any of our many products on-line with our convenient shopping cart. We ship throughout the USA & to addresses world-wide via the US Postal Service. We charge the lowest possible shipping fees. For items in stock, we ship within 24 hours. You can also order by phone, by mail, or by fax. You'll find more details about payment & shipping in the shopping cart. We've been in business since August 1993. We've been on the net (as Astroamerica.com) since January 1996. Hours: Monday - Friday, 10 - 5. Established 1993, The Astrology Center of America is owned & operated by David R. Roell. Except where noted, this entire site (AstroAmerica.com) & its contents are Copyright © 1996, 1997, 1998, 1999, 2000, 2001, 2002, 2003, 2004, by William R. Roell. All rights reserved. Google has many ways of judging which sites are hot & which not. One of them is with links. Which make links a kind of tax. Pay the tax, pay the Google tax, and Google will think more highly of you. Which is to say, you get something for the taxes you pay. Someday Americans will stop griping about the taxes they pay & instead start demanding services in return, but I digress. Rules: If you want to be listed below, 1. Link to us. 2. Email & ask for a complimentary link in the list below. This is limited to Astrology and/or Tarot sites only. Requests from other sites will be ignored. Requests that I link to you and then you will link to me will also be ignored. No banners. Google wants links, there's no point in being fancy. A large website is like a river. It's never the same twice. Click on the title for a PDF excerpt. Click on pics or titles for blurbs & the shopping cart. E.H. Bailey's famous study of birth & conception. Alan Leo's book on progressions, returns, transits & primary directions.